Pearls have been treasured for centuries and according to folklore were thought to bring luck and wisdom to the wearer. 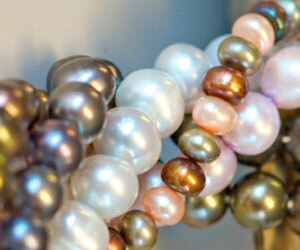 Pearls can range in color including white, pink, brown, gray, and black. Pearls are primarily a product of China and Japan, but larger South Sea pearls and black pearls are primarily from Australia and the waters around Tahiti. Alexandrite was first discovered in Russia and was named for the Russian Tsar Alexander II. Natural Alexandrite is now one of the most valuable gemstones as it is so desirable for its color-changing properties. In different lighting natural Alexandrite can vary between shades of red, green and blue. Even though alexandrite is a relatively newly discovered gemstone, it has already been assigned the healing powers of clearing and maintaining healthy blood vessels in folklore.